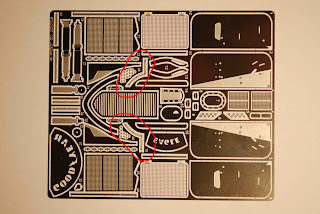 I ordered a set of Studio 27 Photo Etch parts for the Jordan 191. I ordered them from Grand Prix Models (http://www.grandprixmodels.co.uk/) a while back. There is also a set available from Accustation, which I'm sure is very nice as well. 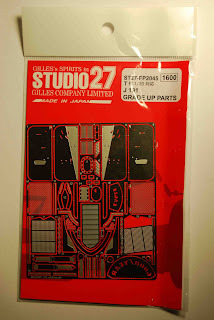 I ordered the set from Studio 27, because I'm considering buying a Studio 27 kit to build and I wanted to see what the quality is like from them first hand. I have to say that this is a fantastic looking photo etch set, and from the look of the high quality parts and adequate instructions, I would recommend buying it! 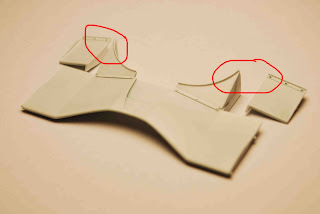 One thing I noticed straight away from the instructions, was that these components are to be used to modify the front wing. Modify the front wing? 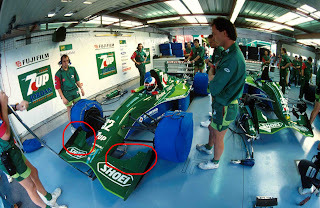 As can be clearly seen in this picture, the Jordan 191 as driven by Schumacher in Belgium featured a different front wing from the one provided in the Tamiya kit. Highlighted are the areas that will have to be modified. Anyone have a set of the studio 27 grade-up instructions,please?